When you woke up yesterday morning we never could have known that a huge milestone would happen during the course of the day. Sure, you went and played tennis for the first time with the 15Love program. Of course, we were all excited to see the sun for the first time in days. You trying out tennis and kept talking about going again next week. We had lunch with Nana and Papa, you introduced them to Phineas & Ferb, and then we went shopping with them. For dinner we had corn on the cob. You were so excited to see one of your summer favorites. You immediately chomped into the corn. Seconds later we heard you yell out to us. You told us that something happened to your teeth and they were moving. I must admit that I did not expect anything. I simply thought you had something stuck in your teeth since Dr. N told us it would be a while before you lost any teeth. Since you were upset I looked in your mouth quickly. I immediately noticed something was up. Your previously straight bottom front teeth were now at a different angle. When I tried to move them, they really wiggled! Your reaction to this shocked me some. Rather than be excited that you were joining all of your friends with a wiggle tooth, you cried. It was so sad and cute at the same time. Daddy and I could not convince you that it was fine to continue eating dinner. Instead, we managed to get you to call everyone to tell them about your tooth. This morning when you woke up I wanted to check again. Much to my surprise when I touched both of the botton front teeth – THEY moved! Yes, there is not only one moving tooth, but two of them! Looks like we need to find that Tooth Fairy pillow and hope that you are like me and they come out without the dentist like poor Daddy. NHL, please do not look at me funny when I cry later on. I know that seeing your toothless grin in the not too distant future is going to bring tears to my eyes. Once again I know that my little boy is growing up way too quickly before my eyes. They grow up way to fast. 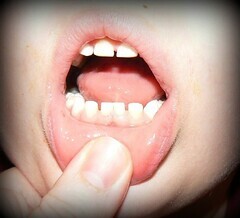 My 6 year old has lost three teeth now and two of them have already grown back.